WataugaWatch: Kushner Beating Bannon in the White House Power Struggle? Kushner Beating Bannon in the White House Power Struggle? Back on January 10, ten days before the Inauguration, I wrote here that I had decided that the appointment of Jared Kushner to a White House job was something I considered hopeful, at a time when all hope seemed lost. Kushner -- who may actually be an escaped upscale department store mannikin -- appears to be on the ascendancy in the Trump White House, with Steve Bannon in eclipse. Bannon lost his seat on the National Security Agency. Bannon opposes any intervention in the Middle East. Kushner's for intervening, which makes the Tomahawk strikes last night possibly some of his work. Yes, Kushner is, though what kind of Democrat marries himself to this administration is left to your fantasy works. 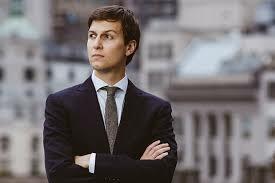 Bottomline for us: Whatever kind of Democrat Kushner is must be shades better than the kind of Dementor that Mr. Bannon is. On one side are Mr. Bannon’s guerrilla warriors, eager to close the nation’s borders, dismantle decades of regulations, empower police departments and take on the establishment of both parties in Washington. On the other are Mr. Kushner’s “Democrats,” an appellation used to describe even Republicans who want to soften Mr. Trump’s rough edges and broaden his narrow popular appeal after months of historically low poll numbers. Between Kushner and Bannon is the man in the Oval Office, who doesn't know what he's doing, who relies on first one and then the other of these competing forces, which produces chaos and uncertainty and horrible public policy. Better hope that Kushner prevails.